Camille Pissarro had rented an apartment on the rue de Rivoli and could see the Tuileries Gardens from his window when he did this painting in the spring of 1899. On a day when it seemed like New York’s winter just wouldn’t quit, I immersed myself in the gardens of Paris without even boarding a plane. Instead, I hopped a subway to The Met Fifth Avenue, where the exhibition, “Public Parks, Private Gardens: Paris to Provence,” recently opened. Drawn mostly from The Met’s permanent collection, this exhibit stems from a French horticultural craze that took root during the late 19th century. As travelers imported botanical specimens from distant lands, local nurseries cultivated them, and many new varieties of plants, trees and flowers became available. Urban renewal in Paris during the same period fueled the demand: boulevards, large parks and public squares all needed to be landscaped. As the city blossomed, Impressionist artists, many of whom were avid gardeners, took their easels outside. They painted landscapes of recently remodeled parks; floral still lifes; and portraits set against garden backdrops. The handsomely curated exhibit at The Met, featuring 150 works by more than 70 artists, mostly from the late 19th century, goes far beyond Paris, but it was the gallery devoted to “Parks for the Public“ that most intrigued me one blustery March afternoon. During visits to Paris, and through literature set there, I had become familiar with some of these settings. But through art, I revisited favorite pathways and passages – and made a new discovery. My introduction to Paris parks, at age 4, was the Tuileries Gardens, which reminded me of a page from Ludwig Bemelmans’ Madeline: The book includes an illustration of Miss Clavel and the girls in front of the fountain, with the Arc de Triomphe visible in the background, on their way to visit Madeline in the hospital after her appendectomy. Disinterested in how French royalty once used these grounds, I grew up remembering them as the place where I had my first pony ride, and an ice cream cone with two side-by-side scoops – a great novelty. With a grown-up’s perspective, I now realize that Paris green spaces are far more than playgrounds. In a city where living quarters tend to be cramped, they double as outdoor living rooms. 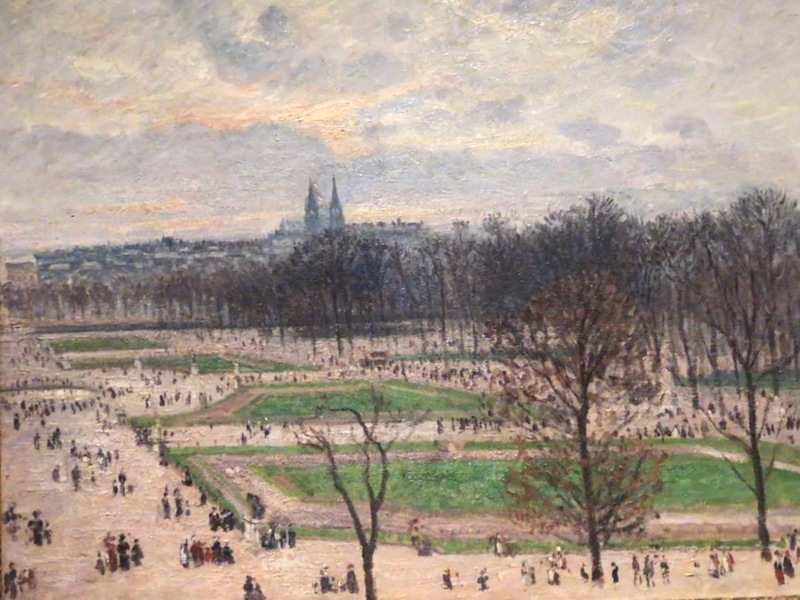 Two oil paintings of the Tuileries in The Met exhibit, both done by Camille Pissarro in 1899, capture that. Pissarro, who spent most of his career doing country landscapes, had rented an apartment on the rue de Rivoli and could see the Tuileries from his window. His paintings record the seasonal changes. In one work, of a winter afternoon, the trees are bare, the colors muted and the garden nearly deserted. The same location, on a spring morning, is rendered in a richer palette, with abundant foliage and throngs of Parisians. 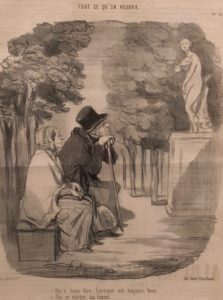 “No matter what one says, old things are always beautiful,” the wife muses in this lithograph by Honoré Daumier. “Yes, my dear, but only in marble,” her husband replies. 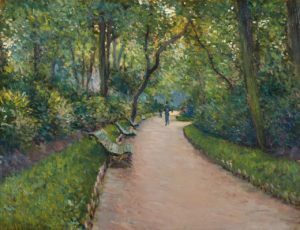 Images by artists ranging from the Frenchman Édouard Vuillard, to the American James McNeill Whistler, depict the eclectic and curiosity-filled Luxembourg Gardens, frequented by two of my favorite American authors who write about Paris. More recently, while posted in Paris for The New Yorker, Adam Gopnik made daily visits to the Luxembourg Gardens with his son, Luke, then a preschooler, who was much enamored with the carousel. In his book Paris to the Moon Gopnik writes that on his own morning jogs in these gardens, he marks his progress by the number of statues he has passed of great French literary figures, looming above him on pedestals. A trio of paintings, displayed together, raised my awareness of a Paris green space that I had never visited: Parc Monceau. It is situated in the 8th arrondissement in the northwestern part of the city. I associate that neighborhood with Avenue des Champs-Élysées – the famous boulevard that extends for 1.17 miles from the Arc de Triomphe to the Place de la Concorde. Now dominated by pricey chain stores and fast-food establishments, it is an area I generally avoid. And that, in part, explains how I have so far overlooked Parc Monceau, at the junction of Boulevard de Courcelles, rue de Prony and rue Georges Berger. Established during the late 18th century by Philippe d’Orléans, Duke of Chartres, it underwent extensive remodeling under the stewardship of Georges-Eugène Haussmann, Emperor Napoléon III’s head of public works. Among other things, curvy paths, reminiscent of an English garden, were installed, and planted with exotic foliage. Here, too, there are commemorative statues – among them of the writers Marcel Proust and Guy de Maupassant, and the composers Frédéric Chopin and Charles Gounod. Both Claude Monet and Gustave Caillebotte, avid gardeners, lived nearby, and it is their paintings of the park that are included in The Met exhibit. In an 1876 landscape by Monet, autumn leaves litter a green expanse, with long shadows visible in the foreground. Low-rise apartments peek out from behind the trees. Dots of paint in the distance are the only hint of human visitors. Hanging beside it is a vertical view of the park, done in the spring of 1878, in which Monet brings the action forward. Along one of the park’s curvy paths, he shows children playing under the watchful eye of their governesses, while elegantly dressed women with parasols stand in the background, perhaps gossiping. In the foreground, a man in a top hat sits alone, with a doleful air. “He creeps me out,” I overheard one museum visitor say to his companion. Gustave Caillebotte lived near Parc Monceau, and captured this solitary scene in summer. My favorite of this trio was not either of these Monets – he is the best-represented artist in the exhibit, with 13 of his works displayed – but the 1877 view of Parc Monceau in summer by Caillebotte. His horizontal look down one of its winding paths conveys the solitude that one can enjoy in a well-timed visit to an urban green space. The figure who approaches us from the distance seems to relish the quiet. Like the chance to escape the crowds in a bustling city, being able to view this painting is a rare opportunity: It is on loan to The Met from the collection of Larry Ellison, the billionaire founder of Oracle. Before returning to Brooklyn – and reality – I stepped outside the galleries, into the central atrium of the museum’s Robert Lehman Wing. In keeping with the theme of the exhibit, it has been planted with potted palms and encircled by curved-back green benches reminiscent of those in Paris parks. All I missed during this New York respite was the tip of a crusty baguette to nibble. Back home, I consulted my small library of books about Paris, to plan a visit to Parc Monceau on my upcoming fall trip. The DK Eyewitness Travel Guide Paris, my favorite handbook to the city, includes this park in a section on eight guided Paris walks to which it allots 90 minutes apiece. Robyn Webb, author of the service-oriented 2014 book, The Paris Vacation Apartment Guide, calls Parc Monceau “exquisitely landscaped,” and reports that it has “one of the grandest bathrooms, the Chartres Pavilion.” Note to file. But the ultimate praise for Parc Monceau comes from Jean-Christophe Napias, a Paris-based journalist and author. In his highly informative little 2006 book, Quiet Corners of Paris, he calls it “romantic, harmonious, Proustian, mysterious, chic, literary, melancholy.” Those who want to delve deeper while visiting the park can now avail themselves of a tool that doesn’t get so much as an Impressionist brushstroke: public Wi-Fi. “Public Parks, Private Gardens: Paris to Provence” continues at The Met Fifth Avenue through July 29. You can find directions, hours and other information here. Deborah L. Jacobs is the author most recently of Four Seasons in a Day: Travel, Transitions and Letting Go of the Place We Call Home, about her adventures — and misadventures — living in France. Follow her on Twitter at @djworking and join her on Facebook here. You can subscribe to future blog posts by using the sign-up box on her website’s homepage.